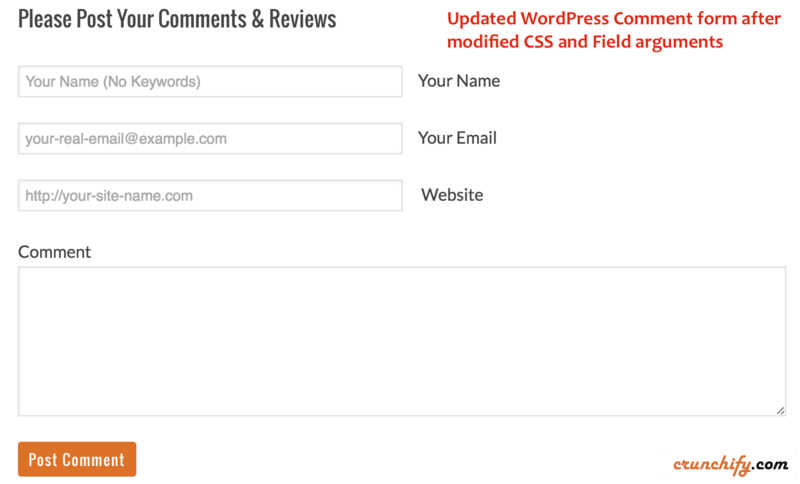 comment_form() outputs a complete commenting form for use within a WordPress template. Most strings and form fields may be controlled through the $args array passed into the function, while you may also choose to use the comment_form_default_fields filter to modify the array of default fields if you’d just like to add a new one or remove a single field. All fields are also individually passed through a filter of the form comment_form_field_$name where $name is the key used in the array of fields. 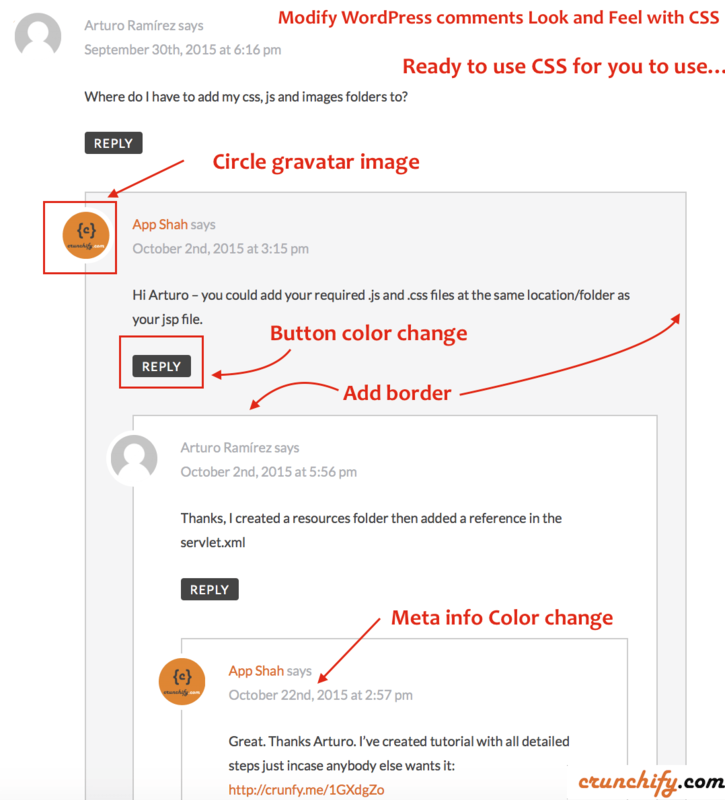 I’ve today modified comment form and added some CSS and noticed very big difference in my comment form. Would like to share my changes with you. Open functions.php file and put below code. 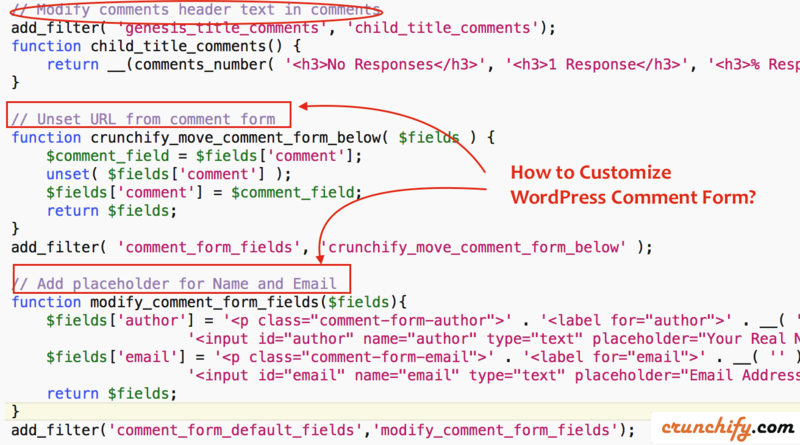 This is what I do have on Crunchify as I’m using Genesis WordPress framework theme. $fields['author'] = '<p class="comment-form-author">' . '<input id="author" placeholder="Your Name (No Keywords)" name="author" type="text" value="' . '<label for="author">' . __( 'Your Name' ) . '</label> ' . $fields['email'] = '<p class="comment-form-email">' . '<input id="email" placeholder="your-real-email@example.com" name="email" type="text" value="' . esc_attr( $commenter['comment_author_email'] ) .
'" size="30"' . $aria_req . ' />' . '<label for="email">' . __( 'Your Email' ) . '</label> ' . $fields['url'] = '<p class="comment-form-url">' . '<label for="url">' . __( 'Website', 'domainreference' ) . '</label>' . Just open comments.php file and replace $args with below code to beautify comment code with placeholders. 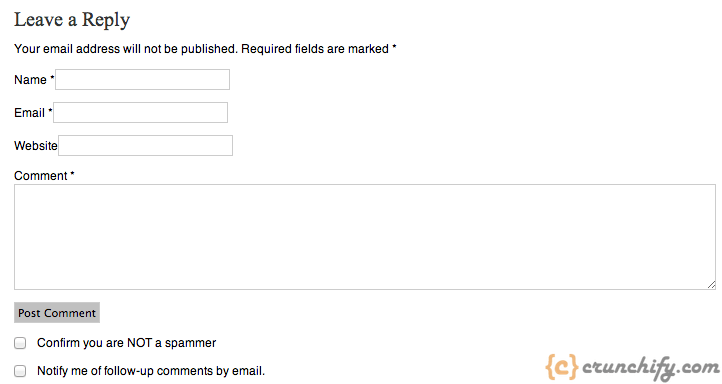 'author' =>'<p class="comment-form-author">' . '<input id="author" placeholder="Your Name (No Keywords)" name="author" type="text" value="' . 'email' => '<p class="comment-form-email">' . '<input id="email" placeholder="your-real-email@example.com" name="email" type="text" value="' . esc_attr( $commenter['comment_author_email'] ) . 'url' => '<p class="comment-form-url">' . To customize comment form, you can use any HTML tags/elements as you can see I’ve placed extra placeholder html tag above. There are number of different ways you could modify comment form. Just keep adding different texts and html Styles to modify it. Now what? Do you want to modify CSS with below look and feel? If you want to modify CSS of your comment form then here is a handy code which you could add to your theme’s style.css file. We are using currently Disqus comment plugin. So far we like it & will continue to use it.